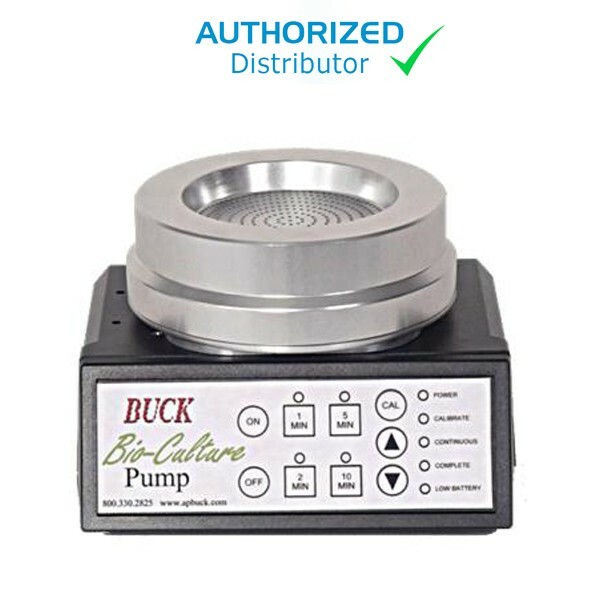 The Buck Bio-Culture™ Pump provides a selectable, continuous, constant sample flowrate and is simple to operate. No tools are required. Its quiet operation allows unobtrusive sampling in IAQ, medical, clean room, public and residential building applications. Calibration (Cal mode, Increase flow, Decrease flow). Positive tactile feedback is provided by the keys. The Buck Bio-Culture™ Pump has internal NiCad batteries to provide a full six hours continuous run time at 100LPM. The standard charger provides a battery recharge in 12-16 hours and allows the unit to operate on AC power; the optional FastOne™ Charger provides a battery recharge in one hour. End of sample notice is provided by the lit LED “Complete” and three short beeps. BUCK Bio-Culture™ Pump, Model B30120 complete with standard 240VAC adapter/charger, pencil torch, tripod, carrying case and instruction manual.